A newly discovered asteroid could provide one of the best recent viewing opportunities for amateur astronomers, according to the British Astronomical Association. “This is the best NEO close approach these past few years and is bright enough to be observed visually in large (>20cm., or 8-inch) aperture telescopes when on the night of Thursday 14th it will appear as a faint slow-moving star,” writes Richard Miles, the director of the BAA’s Asteroids and Remote Planets Section. 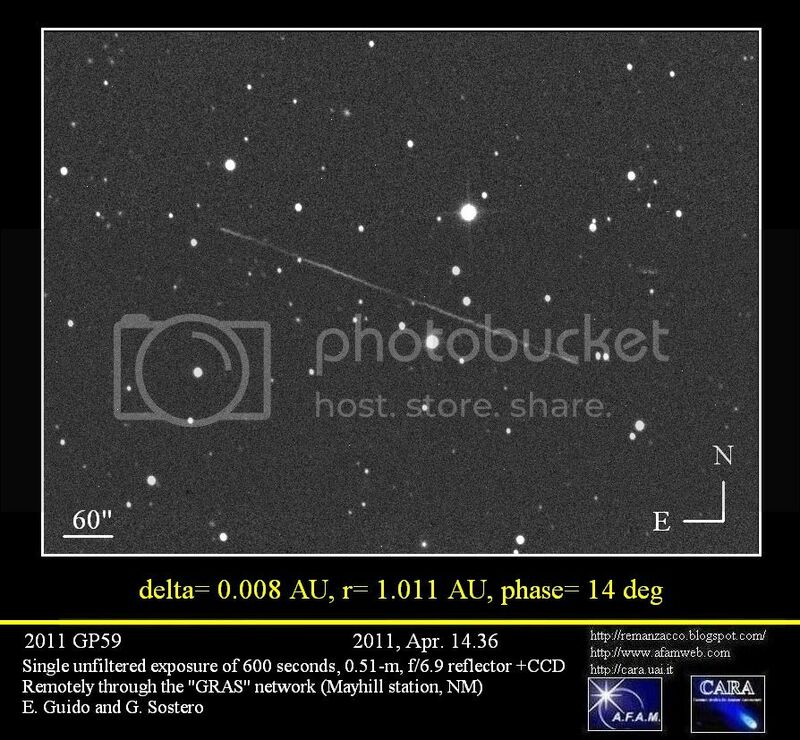 UPDATE: See a new picture of asteroid 2011 GP59 from Ernesto Guido & Giovanni Sostero taken on April 14, 2011, below. Guido & Sostero sent us a note that they imaged 2011 GP59 early on April 14, remotely from the GRAS Observatory (near Mayhill, New Mexico USA) through a 0.51-m, f/6.9 reflector + CCD. “It’s a single unfiltered exposure of 600 seconds, showing 2011 GP59 as trail with brightness fluctuations clearly evident,” they said. 2011 GP59 was discovered just a few days ago and will make its closest approach to the Earth on April 15 at 19h UT at 1.39 lunar-distances. But it will be brightest at an average magnitude of 13.2 around 00h UT on the night of April 14/15 when Miles says it will be very favorably placed in the sky for observers worldwide. The asteroid is approximately 60 meters in diameter and appears to be rotating very quickly, about once every 7.35 minutes. Its oblong in shape and rotation will vary the object’s brightness every 4 minutes or so. This object was discovered on the night of April 8/9 by the Observatorio Astronomico de Mallorca (OAM) using a 0.45-m f/2.8 reflector at their La Sagra facilities (J75) in Andalusia, Spain (see http://www.minorplanets.org/OLS/ ). The observers involved were S. Sanchez, J. Nomen, R. Stoss, M. Hurtado, J. A. Jaume and W. K. Y. Yeung. Brian Skiff of Lowell Observatory has completed a lightcurve analysis which can be found at this link, and positions can be found using the Minor Planet Center’s ephemeris service at this link. You can also find more information on this object from the website of the Remanzacco Observatory in Italy. The British Astronomical Association is also seeking observations of the Moon on Friday, April 15, between 19:00 and 21:00 UT, when the Aristarchus and Herodotus area of the Moon will match the same illumination, to within +/- 0.5 degrees, as that observed during the famous Transient Lunar Phenomena (TLP) seen by Greenacre and Barr from Flagstaff observatory back on Oct. 30, 1963. TLPs are very short changes in the brightness of patches on the face of the Moon, which can last anywhere from a few seconds to a few hours and can grow from less than a few to a hundred kilometers in size. This phenomenon has been observed by hundreds of amateur and professional astronomers, but how and why this occurs is not understood. Some astronomers believe that they are the outcome of lunar outgassing, where gas is being released from the surface of the Moon, but most commonly astronomers think it could be an effect from Earth’s own atmosphere. If you want to help understand TLPs and perhaps observe an event like this for yourself, the BAA Lunar Section is looking for high resolution monochrome, or especially color, images of this area during this time period,, which favors observers in Europe. But you can check this website from the University of Aberystwyth for many locations around the world of when would be a good time to observe a TLP. See more information about how to observe a TLP and how to report your observations at the BAA website.